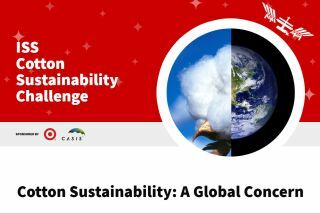 The ISS Cotton Sustainability Challenge, sponsored by CASIS and Target Corporation, was announced on July 19, 2017. The Target Corporation and the Center for the Advancement of Science in Space (CASIS) on Wednesday (July 19) announced the ISS Cotton Sustainability Challenge, which will provide up to $1 million in funding to scientists and researchers who can come up with ways to utilize the station to make cotton farming more effective and sustainable. While it might seem like a stretch that an orbiting laboratory could assist in better Earth-based farming practices, the creators of the challenge listed some of the ways the station could help in the effort. Those include using the station's high-altitude vantage point, which could "provide the agricultural community [with] unique perspectives on sustainable crop production and water usage," challenge officials said. Or, scientists could use the microgravity environment on the station to study how cotton crops respond to different environments and conditions. "Through this funding opportunity, CASIS and NASA will facilitate on-orbit access to the ISS National Lab to advance cotton sustainability solutions that may include projects in plant biology, water technology or remote-sensing technologies," CASIS representatives said in a statement. The world produces more than 25 million tons (23 million metric tons) of cotton each year, according to the CASIS website. To produce just 2.2 lbs. (1 kilogram) of cotton requires between 2,600 and 5,300 gallons (10,000 to 20,000 liters) of water, the website says. "While the economic and personal benefits of cotton are well-understood, the environmental impacts of cotton production are significant," the website says. "The intensive use of agricultural chemicals in cotton farming and production can have severe health impacts on workers and surrounding ecosystems. Organizations around the world are looking for new and innovative ways to address this critical issue over the next few decades." CASIS is encouraging researchers to submit proposals in the areas of fluid dynamics, fluid flow, cotton and plant germination. According to the statement, studies of fluid dynamics in space, and in particular on the dynamics of water, "could lead to a better understanding of ways to enhance sustainability on the ground." The challenge is "slated to run" from Sept. 1 to Nov. 1 of this year, according to the statement. Details have not yet been announced for how to submit an experiment proposal. According to the challenge website, "the winning proposal(s) will receive up to one million dollars in funding and support to send their research to space."